Le panelle sono delle gustose e sfiziose frittelle rotonde fatte di farina di ceci, tipiche di Palermo dove si possono acquistare nei chioschi ai lati della strada o nelle rosticcerie. Le panelle a Palermo e in altre zone della Sicilia vengono servite in panini ricoperti con semi di sesamo: il classico pane con le panelle che è il cibo da strada per eccellenza di Palermo. Seguendo la nostra ricetta potrete preparare anche voi le panelle e mangiarle in compagnia di amici o parenti! Per preparare le panelle, mettete in una pentola capiente l’acqua fredda (1) e, senza accendere il fuoco, setacciatevi la farina di ceci (2). Mescolate energicamente con una frusta, per evitare la formazione di grumi (proprio per questo motivo è importante che l’acqua sia ben fredda), quindi accendete il fuoco a fiamma media (3). Aggiungete il sale e il pepe (4-5) mescolando continuamente. E’ importante tenere il fuoco medio e non smettere mai di mescolare, altrimenti il composto tenderà ad attaccarsi alla pentola. Quando inizierà ad addensarsi e a bollire, cuocete ancora per 10-12 minuti (6). Girate sempre energicamente per non creare grumi: se dovessero formarsi eliminateli passando il composto con un frullatore ad immersione. A fine cottura il composto si presenterà sodo e compatto, aggiungete il prezzemolo (7) e amalgamatelo. Una volta pronto spalmate velocemente circa 30-40 gr di composto, ancora caldo, su 50 piattini di plastica rovesciati, fino a uno spessore di 2-3 mm (8-9). Lasciateli asciugare fino a quando riuscirete a staccarli senza romperli (10): ci vorranno più o meno 30 minuti. Mettete a scaldare l’olio e friggete le panelle per pochi minuti, fino a quando saranno dorate da entrambi i lati (11-12). Fate scolare le panelle su di un foglio di carta assorbente. e friggete le panelle in abbondante olio di semi procedendo come già indicato (16). A cottura ultima scolate le panelle su carta assorbente. Per finire tagliate i panini a metà (17) e farcite ognuno con 5 panelle (18). Gustate le panelle ancora calde! Consumate le panelle appena fatte. Se ne avanza conservatele in frigorifero coperte con la pellicola trasparente.Si sconsiglia la congelazione. Se non trovate il pane tradizionale per le panelle, potete usare un semplice panino bianco. Gustate le panelle come si fa in Sicilia: insaporitele con qualche goccia di succo di limone, saranno irresistibili! Cuocere in forno già caldo a 220° per circa 15 minuti. I tempi di lievitazione potrebbero cambiare a seconda delle stagione e a seconda della temperatura delle vostre case, quindi controllate l’impasto spesso e attendete che questo raddoppi il proprio volume. Anche i tempi di cottura potrebbero essere diversi: se la superficie diventa subito scura, abbassate la temperatura ma non sfornate la focaccia prima dei tempi indicati in ricetta. 1. Don’t scoop flour! When measuring flour, don’t scoop from the bag with your measuring cup. This can compress the flour — up to 25%! Use a spoon to scoop flour into the measuring cup and level off with a knife instead. 2. Weigh your ingredients. One step better is to weigh your flour. Measuring by weight will ensure that you have the correct amount of flour in any recipe. Even 1/2 cup of flour can make a huge difference in the results you get with any recipe. It’s not enough to just use any gluten free flour you choose; gluten free flours aren’t necessarily interchangeable. Follow the flours recommended for each given recipe to get the results promised or use a tried and trusted gluten-free bread mix. 3. Room temperature. Room temperature. Room temperature! 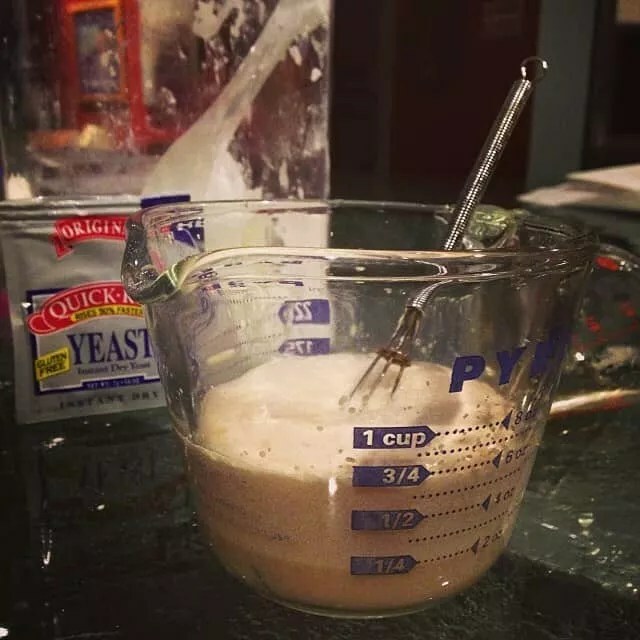 It is particularly important for yeast recipes that you bring all of your ingredients, such as eggs, to room temperature before adding them together to make bread. Yeast needs warmth to grow and if your ingredients are too cold, it may prevent full yeast growth. Don’t make your wet ingredients too hot though, just nice and warm, the way yeast likes it! 4. Don’t follow directions (for wheat bread). It is essential when converting wheat-based bread recipes to gluten-free, that you not follow the directions. That’s right! Break all the wheat/gluten dough rules when baking gluten-free bread! Any kneading beyond simply mixing the dough well, and any punching down of the gluten-free dough will punch the risen life right out of it. Those steps are designed to “exercise the gluten” and make it more elastic. We have no gluten in our recipes, so nothing to exercise, and more than that, these steps will actually cause your gluten-free recipe to fail! It is for this reason that I counsel people when first attempting to make gluten-free breads, to follow a gluten-free bread recipe or two or use a trusted gluten-free bread mix, just to get the hang of it. If you are an accomplished bread baker, it may feel weird for you to abandon these techniques, but trust me, you must! 5. Shape before rising. Because our gluten free breads have no rise and punch down and second rise and punch down … you’ll want to shape any breads before the rise (they’ll only rise once!). Dinner rolls should rise in the shape or tin you would like them to bake in; bread sticks should be formed before rising; cinnamon rolls should rise in their pans; challah must be braided and then allowed to rise. Don’t mess with gluten-free dough once it has risen, just bake it! 6. High altitude can change the way yeast doughs behave.Have a look at my High Altitude GF Cooking Tips. Making delicious gluten free bread isn’t difficult, it just seems like it ought to be. 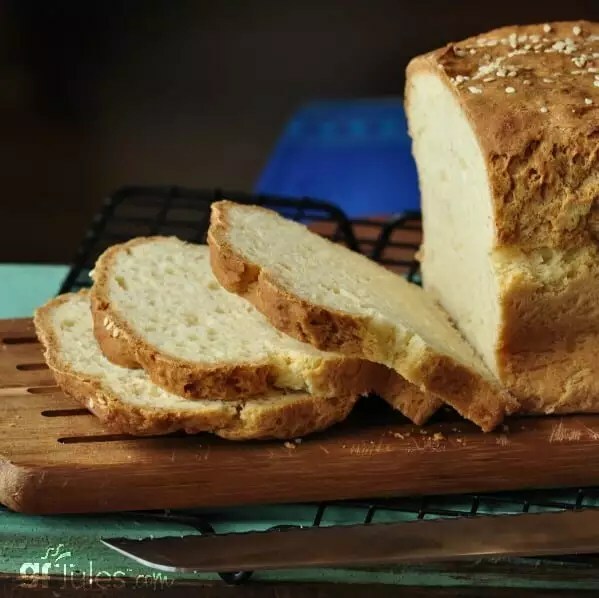 In fact, in many ways it is easier and quicker to bake a gluten free bread loaf than it is to bake a traditional gluten bread. With the right recipe, you don’t even need a loaf pan! Follow my gluten free bread help check list, and it will bring you delicious gluten free bread baking success! Note: for tips on baking gluten-free bread with a bread machine, hop to my article here. For my easy, no-fail gfJules Gluten Free Bread Mix (voted #1 Gluten Free Bread Mix in the 2017 Gluten Free Awards — second year in a row!) go here. For a review of my favorite bread makers, hop here. For yeast-free gluten free sandwich bread, hop to my recipe here; no yeast dinner rolls hop to my recipe here. 2. Weigh your ingredients. One step better is to weigh your flour. My gfJules™ All Purpose Gluten Free Flour weighs 135 grams per cup. Measuring by weight will ensure that you have the correct amount of flour in any recipe. 3. Room temperature. Room temperature. Room temperature!It is particularly important for yeast recipes that you bring all of your ingredients, such as eggs, to room temperature before adding them together to make bread. Yeast needs warmth to grow and if your ingredients are too cold, it may prevent full yeast growth. Don’t make your wet ingredients too hot though, just nice and warm, the way yeast likes it! 7. Take your bread’s temperature. It is very important not to take your bread out of the oven before it is fully cooked. If the bread has a rubbery layer at the bottom, this usually means it was not fully cooked. 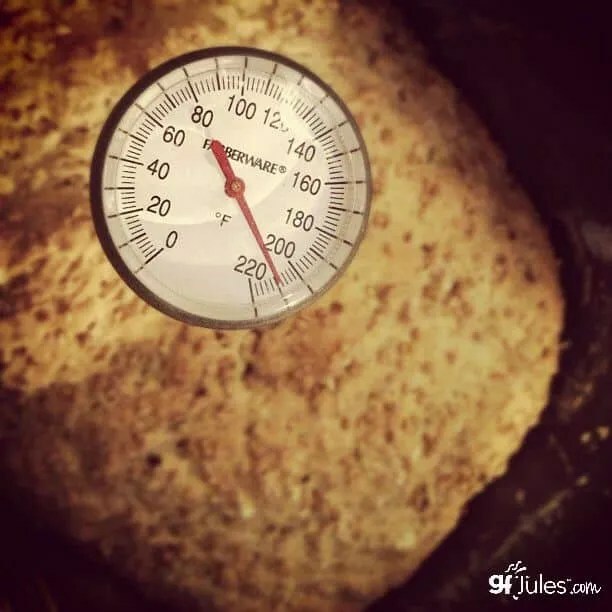 The best way to tell if the bread is done is to insert an instant read thermometer all the way to the bottom of the loaf (but not touching the pan). The temperature should be approximately 205-210º F when it is done. Your bread should keep its shape when it is completely baked. Internal thermometers for bread baking are available in my shop. 8. Change your bread pan. Sometimes metal pans work better than glass for fully cooking a loaf of bread. Metal pans do not have to be fancy or expensive, and you can often even find them in your local grocery store. Different bread pan sizes, shapes and materials can affect how long and evenly the gluten free bread bakes. 9. Make sure your rising spot is nice and warm. A great method for letting your yeast breads rise before baking is to turn on your oven to 200º F, then turn it off when it has reached temperature. 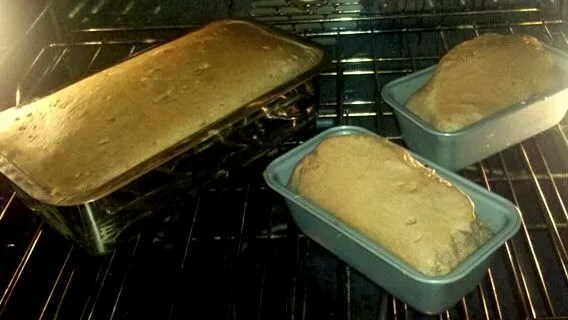 Put your un-raised bread into the warmed oven with an oiled piece of parchment on top and a bowl of water in the oven with it, then let it rise according to directions. Once raised, remove the parchment and bake according to directions. 10. Find the perfect rise time and place.The longer you can let your bread rise, the better it will taste and the less likely it will be to collapse. A good rule of thumb is to let the bread rise to the top of your pan before baking; a slower, cooler rise to that level will produce a better loaf, so make sure it isn’t rising in too warm of a spot. If you can let the gluten free bread dough rise overnight in a cool place, the slower rise will provide a stronger cell structure and more of a sourdough flavor when baked the next day. If you’re still having issues with getting your yeast breads to rise, try “proofing” your yeast first. I prefer using “Quick Rise” or “Rapid Rise” yeast for gluten-free yeast breads. We don’t have the punch-down and second rise necessary with most gluten loaves, so it works well to activate the yeast and let it start doing its thing right away! Place the yeast in a bowl with the liquid called for in the recipe (water, milk, etc. ), but make sure it’s warm. If you can add a teaspoon of sugar, that’s helpful. Whisk it gently and let it sit for 5 minutes. If it’s starting to have that familiar yeasty smell, foam up and swell, it’s good and you can add it to your recipe; if it’s stagnating and not getting foamy or rising, throw it out. 12. Make Sure Ingredients are Fresh. Yeast can go bad, as can baking soda and baking powder. Sometimes the problem is your ingredients, not you. What a relief, right? Once open, baking powder and baking soda should be used within 3 months, or less if it’s particularly hot and humid in your kitchen. 13. Cool bread slowly. When your bread is done cooking, turn off the oven and open the door so that the bread can cool slowly. Taking the bread out of a hot oven and quickly transferring it to a cool counter can sometimes cause the loaf to sink in. If it still sinks, it may have too much moisture to support itself fully. It should still taste great, but if you have your heart set on a nice crowned loaf, next time try cutting back on the liquid a bit in that recipe or adding 1/4 cup of flaxseed meal to help support the bread’s structure and enhance its nutritional value, all in one! Altitude and even the day’s weather can affect sometimes-picky yeast recipes. 14. Calibrate your oven temperature. Oven temperatures are frequently off by as little as 25 degrees and it can make a big difference in something as finicky as a yeast bread. Invest in an oven thermometer and adjust your oven’s temperature so your bread will bake comfortably, at the temperature it likes. 15. Bubbles add air (duh, right?). It’s amazing what adding bubbles can do for the lift in your bread loaf! Try the same amount of club soda, gluten-free beer, ginger ale, 7-Up, Perrier … you get the picture. Room temperature, of course, and measured appropriately (let the bubbles settle for accurate measurements). Check out this gorgeous gluten-free beer bread! 16. Fixing that rubbery bottom. If you still wind up with a rubbery bottom on your loaf, there are a few things that could have gone wrong. First, you might have over-beaten the dough. Unlike gluten doughs, gluten-free bread doughs should not be overworked, and doing so can sometimes make them a bit rubbery. Second, if you are baking from scratch and adding your own xanthan or guar gum, you might have added too much. Third, there might be too much liquid in your recipe, all settling at the bottom and not baking off, while also weighing down the dough. Fourth, the loaf might not have baked all the way. If the top is baked and getting a nice crust, but the bottom isn’t all the way done, cover the loaf with foil and keep baking! 17. Where your loaf is baking also makes a difference. Too close to the top of the oven, and the top will bake much more quickly than the rest of the bread, causing a split in the loaf. That’s quite a chasm, all because the bread rose so high that it nearly touched the oven’s heating element (and heat rises, don’t forget!). The rack of the oven shouldn’t be so high that the crust is that close to the heating element, nor should it be so low that the bottom of the bread burns from a lower heating element. Sometimes it takes a bit of experimenting to get to know your oven and the best placement for baking bread. Convection bake settings also help with this, as convection keeps the temperature in the whole oven more consistent. Side note: also be sure there’s not an oven rack above the one on which your bread is baking – you don’t want the bread to rise during the bake and bump into the bottom of another rack! Turn your bread half-way during the bake cycle to prevent one side from rising higher than the other if your oven tends to cause this to happen; it’s made more pronounced in convection ovens. 18. You don’t even need a bread pan to make great gluten free bread! Try making a gluten free artisan loaf on a parchment-lined baking sheet, or baking in a springform or tall-sided oven-safe bowl or pan. Or even use muffin cups or popover trays! Your bread will be yummy no matter how you bake it, if you use the right ingredients! Heat a small frying pan over medium heat. Add a glug of oil and, when hot, add half the chopped garlic along with the breadcrumbs. Cook over medium heat for about 3 minutes until the breadcrumbs are golden and toasted and the garlic is tender and lightly browned. Season with salt and pepper and toss together. Drain on paper towels. Meanwhile, heat a frying pan over medium heat and add a little oil. Sauté the remaining garlic and the chile for 1–2 minutes. Flake the sardines into small pieces, then toss in the pan with the garlic and chile. Drain the cooked pasta and add to the pan with the sardines. Toss to mix well. Add the oregano, taste, and adjust the seasoning as necessary. When ready to serve, stir the arugula leaves into the pasta and divide between serving plates. Garnish with the crisp garlic breadcrumbs and serve immediately. *This recipe must be planned for, but it takes quite literally 1 minute of active planning. Rather than listing dry, raw quinoa as an ingredient and then instructing you to soak it for 12 hours, I’ve included the soaked and drained quinoa as an ingredient. Simply place about 1 1/2 cups (by volume, if you like) raw quinoa in a bowl or jar, and add enough tap water to cover by about in inch. Cover and allow to soak in the refrigerator overnight, or for up to 24 hours. Then, drain in a fine mesh sieve or nut milk bag, and measure the soaked and drained quinoa by weight for use in the recipe. In a blender or food processor, place the eggs, oil, soaked and drained quinoa and vanilla, and blend or process until smooth. The mixture should become lighter in color. You will still see flecks of the quinoa, but process until it’s as smooth as possible. In a large bowl, whisk together the sugar, cocoa, baking powder, baking soda, and salt. Add the eggs and oil mixture, and mix until well-combined. The mixture will be thick. If you’ve used Swerve in place of sugar, add 1 tablespoon of nondairy milk to the batter and mix to combine, so the batter is easier to scoop. Divide the batter among the prepared wells of the muffin tin and spread into an even layer in each well using wet fingers. Place in the center of the preheated oven and bake until the cupcakes are set in the center and spring back when pressed very gently in the center (about 19 minutes). Remove the tin from the oven and allow the cupcakes to cool in the pan for about 10 minutes before turning out onto a wire rack to cool completely. The finished and cooled cupcakes can be stored in a sealed container at room temperature for up to 3 days, or wrapped tightly in plastic wrap and frozen for storage of up to 2 months. Allow to thaw at room temperature before serving. Versate in una ciotola la farina e la scorza di limone grattugiata. Aggiungete lo yogurt bianco dolce e mescolate con una forchetta. Iniziare quindi ad impastare a mano, per 4 o 5 minuti. Vedrete che l’impasto, inizialmente un pò secco, prende corpo e diventa molto più lavorabile, potrete formare una palla, per niente appiccicosa. Lasciate riposare l’impasto per una quindicina di minuti a temperatura ambiente e nel frattempo preparate il piano di lavoro, con un foglio di carta da forno e il matterello. Senza bisogno di spolverizzare con ulteriore farina, stendete l’impasto fino allo spessore di un millimetro. Tagliate a strisce, formando dei rettangoli stretti e lunghi. Tirare con la macchina cosi’ vengon piu’ sottili e croccanti. Mettete a scaldare un padellino con 3 dita di olio di semi. Appena sarà caldo, friggete 2 o tre chiacchiere alla volta per pochi secondi, girandole su entrambi i lati, finchè non appariranno gonfie e dorate. Poggiate le chiacchiere sulla carta assorbente per togliere l’olio in eccesso, spolverizzate con zucchero a velo e servite. 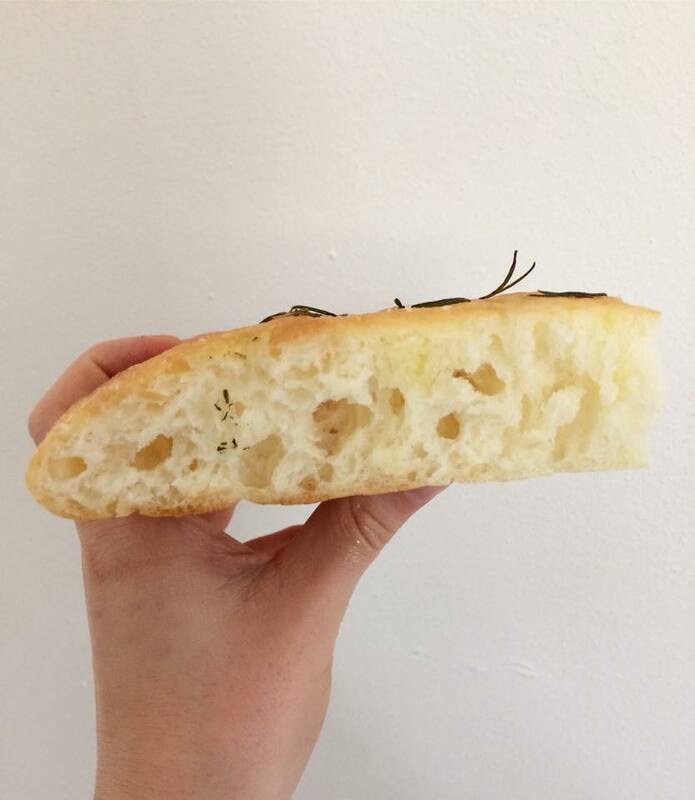 Versare nel cestello della macchina del pane gli ingredienti nell’ordine riportato in ricetta, inserendo il lievito di birra nell’apposito scomparto della macchina del pane. Programmare la macchina del pane sul programma 7 ( durata 3 ore), dimensione del pane M (per le farine glutinose è la misura media, pari a 400g di farina, ma per le nostre farine glutenfree lavora bene con 250g). Trascorso il tempo di cottura, estrarre il cestello (attenzione perchè diventa bollente) e lasciar raffreddare completamente il pane in cassetta prima di sformarlo. Tiepido è buonissimo, ma vi consiglio di aspetare che si raffreeddi per tagliare meglio le fette.